April 2015 n Performance & Hotrod Business n 77 "Word of mouth goes a long way, too," he noted. "Many see our workmanship by looking at trucks we have built for others, then seek us out." Customer Profile Talbert says most customers are profes- sionals in various fields of work and many are retired before they decide to restore a vehicle. He believes some customers are "on a mission looking for top quality and these are the ones who tend to trade with us to complete a project. Top-quality workmanship can't be had on the cheap. "More often than not, the folks shop- ping for a cheap price don't stop here," he adds. "Don't get me wrong, we do quality work for the absolute best price we can offer it; it's just that price shoppers will not pay the price for quality." Van Dongen says most of the consum- ers Omix-ADA reaches with its military- related offerings are amateur restorers who are slightly older than 40. Their wants and shopping habits vary depending on what they are working on at the moment. For some, price is the main driver, but for others who are looking for a particu- lar part, quality is more important. "The more authentic the restoration desired, the focus will shift to quality over price," he observes. "Due to the nature of this market, people are buying where they can find the specific products that they need." Kavanaugh of Retired Warhorses notes, "There are customers who like the mechanical aspect of restoring a military vehicle and a very large percentage are ex-military personnel. 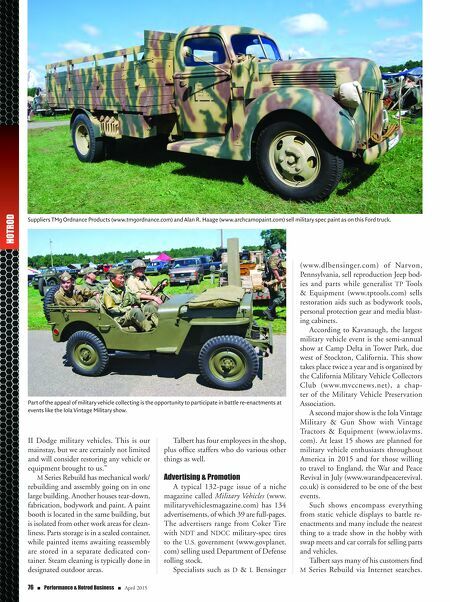 They tend to like whatever they drove during their military careers: Korean War M-38s, Vietnam-era M151s, Desert Storm rigs—to current- day M-Series, etc. The largest focus is on WWII. There was a resurgence of WWII interest after Saving Private Ryan. Like anything else it's, cyclical." According to Kavanaugh, the interna- tional market is very strong. "A lot falls under Lend Lease," he explains. 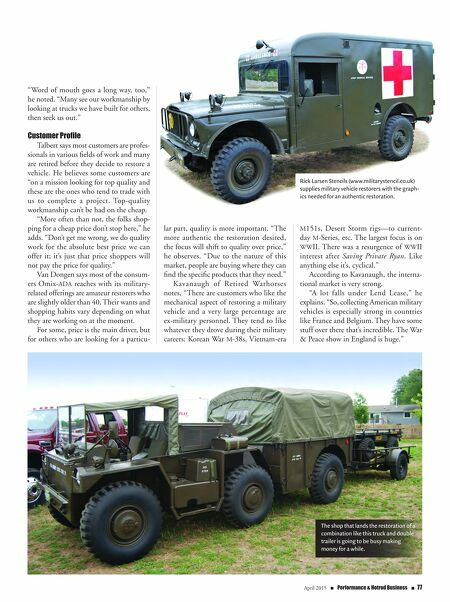 "So, collecting American military vehicles is especially strong in countries like France and Belgium. They have some stuff over there that's incredible. The War & Peace show in England is huge." The shop that lands the restoration of a combination like this truck and double trailer is going to be busy making money for a while. Rick Larsen Stencils (www.militarystencil.co.uk) supplies military vehicle restorers with the graph- ics needed for an authentic restoration.